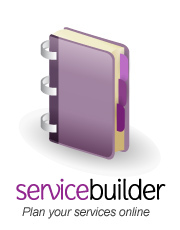 This page explains how to use the pre-defined Templates in ServiceBuilder. For information about how to create your own templates, please click here. Select a service from one of the three drop-down lists. Enter the Date of the service and press the "Next" buttton. Your selected template will now display on screen. For example, if you choose the "Morning Prayer" template, you will see something like this. introduction You are worthy, our Lord and God, to receive glory and honour and power, for you created all things, and by your will they existed and were created. static text (the text of Rev 4:11). To use the template, fill in the text areas and select an item from the drop down lists.